A butcher in Rothbury sold out of sausages in hours after he took part in a Radio 2 phone-in quiz. Morris Adamson, owner of Rothbury Family Butchers in Townfoot, took part in Ken Bruce’s Popmaster quiz, which he won, and got talking with the host about his business. 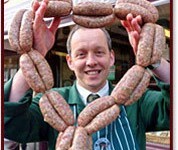 Morris said: “Ken asked me which was our most popular sausage. I told him it was our Cragside Cracker, which is made with pork, rosemary and red onion, and that I would send some for him to try. Days later, TV chef Ainsley Harriott visited the shop to stock up on ingredients. Morris said: “Needless to say I was shocked when my mobile rang and it was Ainsley. “He was surprising a young girl who is a true local hero and was asking for food donations to help with the paella he was making for her. Full story from the Northumberland Gazette.